What titles most shaped the site's readers? Harry Potter, To Kill A Mockingbird, The Lord of the Rings—and the Bible. A few weeks ago, I started to see a viral status being passed around my Facebook friends. I’m usually a skeptic of such meme-y Facebook statuses, but people gathering around books that meant something to them melted even my cold heart. So I asked the Facebook Data Science team if this status had gotten “big” enough to attract their attention, and what they had seen in it. They replied with something I wasn’t expecting: a list of the 20 books most cited by Facebook users who participated in the game. In a new blog post, they’ve released that list (it’s also below) and some of their methodology. The data science team analyzed more than 130,000 statuses, stripped them of their identifying information and looked for common strings—that is, shared snippets of text and title—and ranked them by popularity. The final list is an interesting, somewhat intuitive list of of titles. There’s some fantasy on it, some contemporary fiction, some classics. It’s also also steeped in books that Americans typically encounter during adolescence, whether as a traditional school assignment (The Great Gatsby) or on their own, as a “young adult” novel (Harry Potter, etc.). Even before “young adult” literature was a thing, books were shaping young adults. ​Whose taste are we seeing here? Of the hundred-thousand English-speaking users sampled, women outnumbered men more than three to one. Sixty-three percent of the participants live in the United States, 9.3 percent live in India, and 6.3 percent live in the United Kingdom. And the average age of participants was 37. One can also look at connections between the books, e.g. ‘people who listed X also listed Y’, using pointwise mutual information. In the network visualization, each node represents a book, sized by the frequency with which it was mentioned, as an edge represents an usual number of co-occurrences of the two books in the lists. You can click on the map for a higher level of detail. One thing that strikes me about it is how genres appear to clump: Up at the top, you have a high fantasy cluster; to the left, European classics like Shakespeare; at the right, American classics like East of Eden. 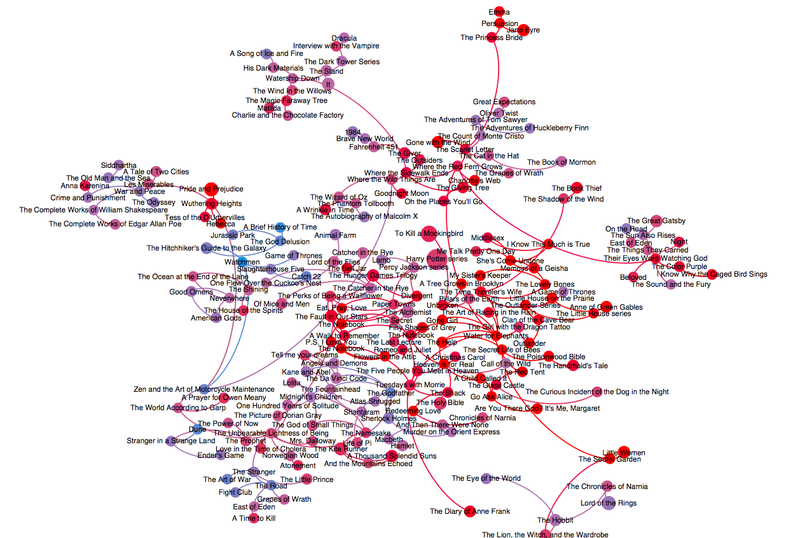 Another fun feature of that map: People who loved Persuasion, Emma, and Jane Eyre also love Princess Bride. Mawwiage! These are the books people confess to loving. But are they also the books people put their buck behind? I turned to another online data source: Amazon’s list of its top-selling books of the two-thousand-aughts—the Books of the Decade—can give us a clue. While imperfect, it gives us a different window into literary taste from the same period. On Amazon’s list, as on Facebook’s, Harry Potter reigns supreme, filling four of the top 10 slots. But Amazon accounts for an entire genre which Facebook users seemingly neglected to mention. Readers may want to know Who Moved My Cheese, or make the leap from Good to Great, but all that cheddar transportation doesn’t stick with them. Some familiar titles follow: The Help, Water for Elephants, and the complete boxed set of The Chronicles of Narnia. That said, this is a fairly different list from Facebook’s, with absent-on-Facebook Twilight making a strong showing. You can chalk this up to the older age of the average respondent—or to the fact that Twilight, while popular, failed to “stick with” its readers. As a devout Millennial, I choose of course to believe the latter option.